Grafton, Mass. – The sample size may still be considered small but let's not kid ourselves. Milford, once again, appears to be every bit the part of the team that won a Division 1 state title a year ago. In a battle between two defending state champions, the Scarlet Hawks' offense took it to Grafton on Friday in the form of an 8-1 victory. Milfored erased an early deficit, belting out 13 hits en route to its third win against no defeats. On top of that, senior pitcher Kelley Reichert settled in nicely following a rough beginning, allowing just four hits and striking out nine in her six innings of work. 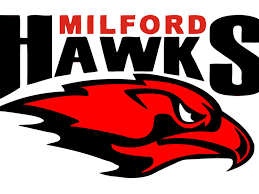 "All of these girls are perfectionists," said Milford coach Steve DiVitto. "They are not as much down on themselves as they are disappointed with a certain outcome. You can be disappointed but you cannot let it affect your game. That is one thing the girls do a really nice job of. They're always picking each other up. Throughout our line up today the girls were delivering in big spots and Kelley pitched great." Reichert was able to avert serious trouble in the bottom of the first that, in turn, proved to be the difference maker in this one. After plating a run in the bottom of the first on a Sarah Remilard RBI, behind some good at-bats and some shoddy Scarlet Hawks defense, Grafton (1-1) would load the bases with nobody out. Seeking a rare opportunity to put the Scarlet Hawks away early, the Indians failed in their quest after Reichert fanned three straight batters to keep the damage minimal. "Right off the bat we were making some pretty good contact," Grafton coach John Gemme said. "They gave us a couple of plays during the inning to load the bases and then our next three batters seemed to tense up a bit and it didn't work out for us." As a result of Reichert's ability to avoid serious danger, it allowed Milford to carry momentum to the plate. The Scarlet Hawks scored a pair of runs in the top of the second before adding another in the fourth. They then blew this contest wide-open wita five run fifth. "Obviously we made a couple of mistakes early which is uncharacteristic of us," said DiVitto. "Just a week into the season and we are still trying to get comfortable in the field. But later in the game we were able to turn that page and move along. Kelley did a great job of battling to get us out of that first inning. That seemed to pay huge dividends for us as we were able to come back right away in the second with two runs and turn things right around for us." Outside of the first in which Reichert was victimized by three Scarlet Hawk errors, she remain focused, as she managed to get ahead of the Indian hitters with first pitch strikes by using a mix of fastballs, risers and change-ups. The Scarlet Hawks wasted little time grabbing the lead for good in the top half of the second. A single by Emily Hartman was followed up by a double off the bat of Shannon Cormier. Alexis Caron, running for Hartman, crossed the plate on Maddy Bonvino's grounder. Bonvino was ruled safe after first baseman Emily Henning could not handle the throw. Moments later, Cormier gave Milford a 2-1 lead, sprinting home on a passed ball. In the Scarlet Hawks' half of the fourth, Cormier led off with a bloop double to left and came around to score shortly thereafter on Reichert's single. Grafton, who won its third Division 2 state crown since 2012 last season, provided little resistance against Reichert following the initial frame. Yet still within striking distance entering the fifth, the Indians saw it all come unraveled as Milford sent 10 batters to the plate and smacked seven hits to pull away. In that decisive inning, Kate Irwin opened by legging out an infield single, stole second and moved to third on a throwing error. She trotted home on Emily Piergustavo's infield single to make it 4-1. Another Indians fielding mistake advanced Piergustavo to second base. The senior, headed to UConn next year, came home on Providence College-bound Jess Tomaso's double. A few moments later, Tomaso moved to third on another passed ball. The senior would later cross the plate on Cormier's ground out. Reichert next singled setting the stage for Bonvino's two-run homer over the left field fence to put the Scarlet Hawks comfortably in front by seven runs. "That was a much-needed hit in the game and for myself personally," Bonvino said. "I've been in a little bit of a hitting slump to start the season. It was nice to finally get out of that and hopefully today will break things open for me. Even after we were down, we know we have the bats to come back, and we are behind Kelley constantly. As big as last season was for us, we want to put it behind us because if we dwell on it then we are not going to do as well this season." Reichert quickly disposed of the Indians in the bottom of the fifth and sixth innings, respectively before giving way to Tomaso, who closed things out in the seventh. "Defensively we made some mistakes," said Gemme. "They got really comfortable in that fifth inning and I think (Evans) probably let some of those mistakes get to her instead of taking charge a little bit."